I'm happy because the mail was good to me today. 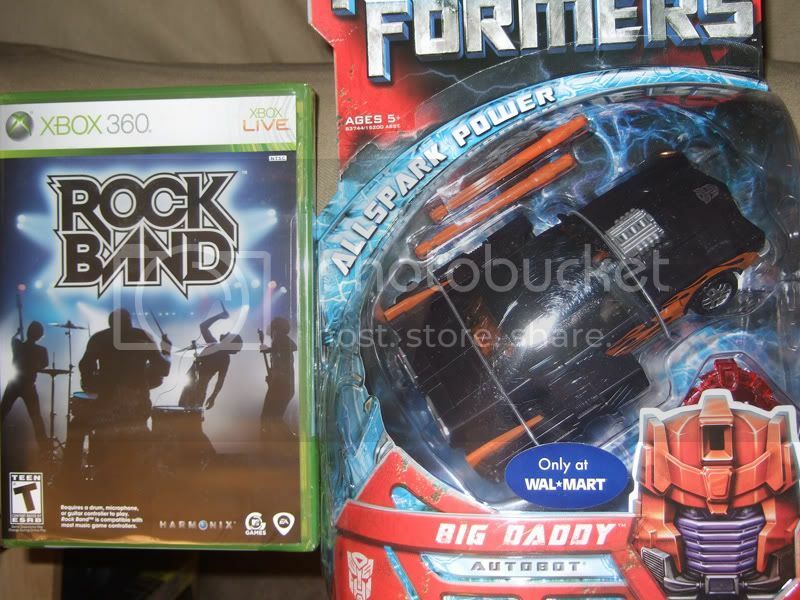 My overpriced Big Daddy, and to make up for it, my severely underpriced Rock Band. Yay they changed the station at the office!!! God i was tired of B101. If i never hear Faith Hill again, it'll be too soon. woohoo!!! anyone of you fellow office workers knows the drill. EDIT: my least favorite co-worker was out today!! ah, the relief. Edited by Maximo Prime, 21 March 2008 - 02:21 PM. "So Long and Thanks for all the Fish" so far its the only thing to make me smile today. I finished my first week at the my new job and found that I really like it. I'm actually getting to use my skills as an artist and writer, and I don't have to do outside sales. Best part is, a newspaper is actually not that hard to put together. Edited by Knight in Rusty Armor, 22 March 2008 - 08:37 AM. I was in Toronto and found the Hunt for Grievous action figure pack. Got the whole thing for under $25. Celebrating my wednesday birthday early! Yaaay! Yesterday my mother-in-law gave us a cookie tin full of lindt truffles and cadbury eggs!!! what diet?! lessee today... rumors that the Encore Omega Supreme would have a resculpted cartoon accurate face! A mistake in my checkbook turned out for the better, giving me more money than I thought I had. I was at Wal-Mart when I saw a customer clearing off a bunch of RC cars and lifting up the bottom shelf. When he lifted it up, he revealed a stash of all sorts of in-demand toys: Big Daddy, the new wave of 25th Joes, some Star Wars figs, etc. I grabbed a handful of Joes, weeding out a Cobra Air Trooper and thanked the guy for his efforts (ignoring him as he demanded I give it back). I love taking toys from Ebay scalpers, and this guy definitely was one. I also told the toy manager on my way out what transpired. Sorry guys, I couldn't grab the Big Daddy, as he lunged for it the second I grabbed the handful of Joes. Okay, that? You know what that is? Ugh, that same rumor has had the very opposite effect on me, but that's a topic for another thread. yeah diff'rent strokes i guess! I was planning on KBing one with a spare Magnaboss face. Now I might not have to, if the rumor is true! Got both KotOR II and Jedi Outcast for only $15! Got to see 12 classic Warner Bros. and MGM cartoon shorts in a theatre, as part of a tribute to Tex Avery and Michael Maltese at the Academy of Motion Picture Arts & Sciences. A Wild Hare, Porky's Duck Hunt, What's Opera Doc?, Little Rural Riding Hood, Drag-Along Droopy, House of Tomorrow, You Ought To Be In Pictures, For Scent-Imental Reasons, and a few others. It was great to see the shorts on the big screen with an appreciative audience, and to listen to the Q&A panel afterwards with Maltese's daughter, Avery's biographer, voice actor June Foray, and a couple of animators.